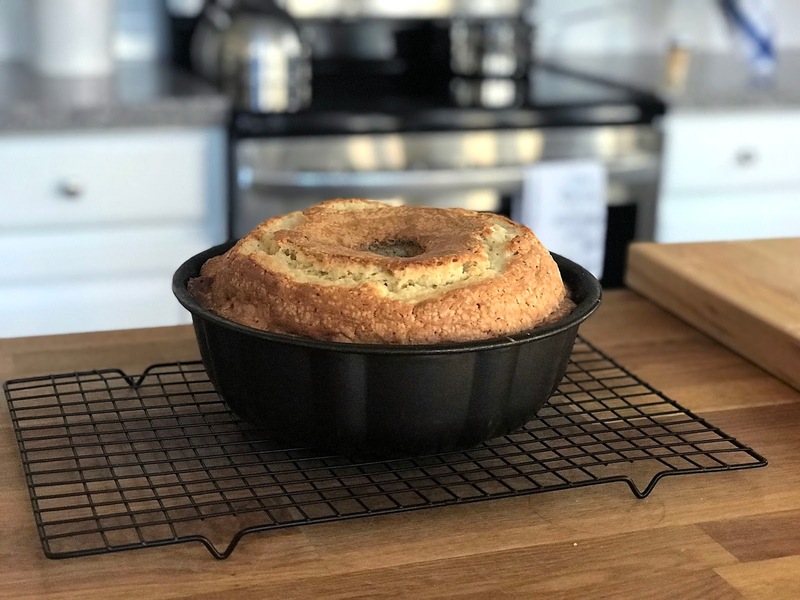 There are a few recipes that seem to be just so Southern and pound cake is one of them. I've been holding back on sharing this recipe for a long while. It is my FAVORITE pound cake recipe in the universe!! Why have I been holding back? Well, selfishness, I suppose. It's just SO SO SO good. Mr. U says he likes it best with a glass of sweet tea. Me? I just like it period!! See how the individual slice looks? Look at the crust toward the bottom of the photo- now THAT is good crust!!! Kind of doughy looking, but not doughy at all- just dense and full of flavor!!! Here's what you need for this recipe. Not a lot of ingredients and there's a really good chance you've already got all you need waiting for you in your kitchen. Heat oven to 315 degrees. 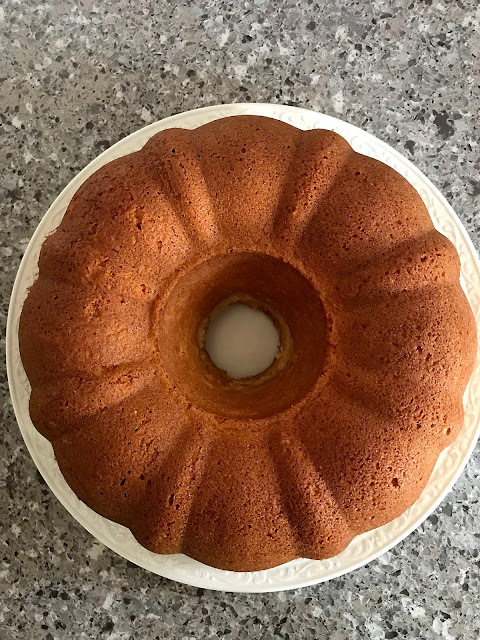 Prepare a bundt pan by wiping it throughly all inside with butter or shortening and then dusting with flour and pour out any extra flour remaining in pan. (You can use Pam and spray the pan, too, if you'd rather). In one bowl, sift flour and baking soda together and set aside. 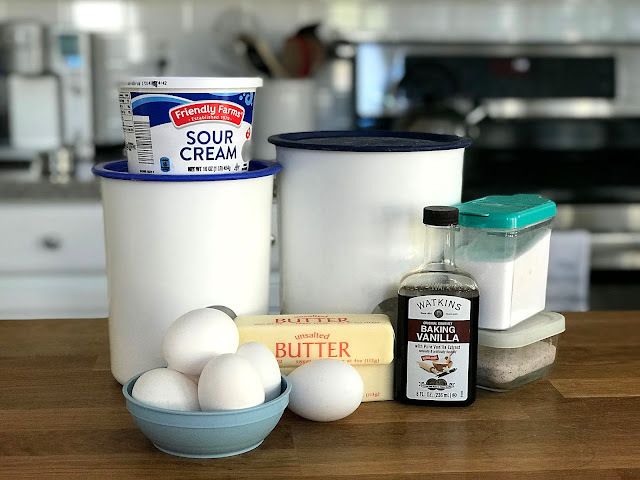 In another bowl, cream butter and sugar well; add vanilla and then eggs- one yolk at a time. Add 1/3 of the flour/baking soda mixture and mix well. Then add 1/2 the sour cream and mix well. Then add another 1/3 of the flour/baking soda mixture and mix well. Then add the rest of the sour cream and mix well. Finally add the rest of the flour/baking soda mixture and mix well. In a third bowl, add salt to the egg whites and beat with mixer until fluffy. Then gently fold egg whites into the batter. Carefully pour into your prepared bundt pan and bake 1 hour and 15 minutes until done. There should be no jiggle left and a toothpick inserted will come out clean. Cool 5 minutes in pan and then turn onto a plate to cool completely. This looks delicious! I love anything with sourcream. It always seems to make it so moist. Your Mom was absolutely right! That is the proper way to make a Bundt cake, with that yummy crust on the bottom. I can't wait to make this beauty because I just know it will taste as good as it looks! I prefer the larger pieces, too! Looks delicious! I don't think that I have ever had sour cream pound cake before. It looks delicious! Thanks for sharing! One question...I was checking the recipe and wanted to make sure that the oven temperature of 315 degrees is correct. Is it really 315 degrees, or 325 degrees?? Hi Debi! Yes 315 degrees. Seems so random, doesn’t it? But totally works. I’ve made this in three different ovens over the years and it’s always perfect. My guess is any higher would dry it out. Thank you so much! I'm going to make this for Valentine's Day and I know there won't be a crumb left! I love the versatility of a recipe like this...it can be enjoyed "as is" or dressed up with a dollop of whipped cream and some sliced fruit or fresh berries. We leave those on the side, so everyone can fix their own slice just the way they like it. Yay! Sounds like you’ll have a tasty Valentine’s Day! Love all your “dressed up” ideas!!!! 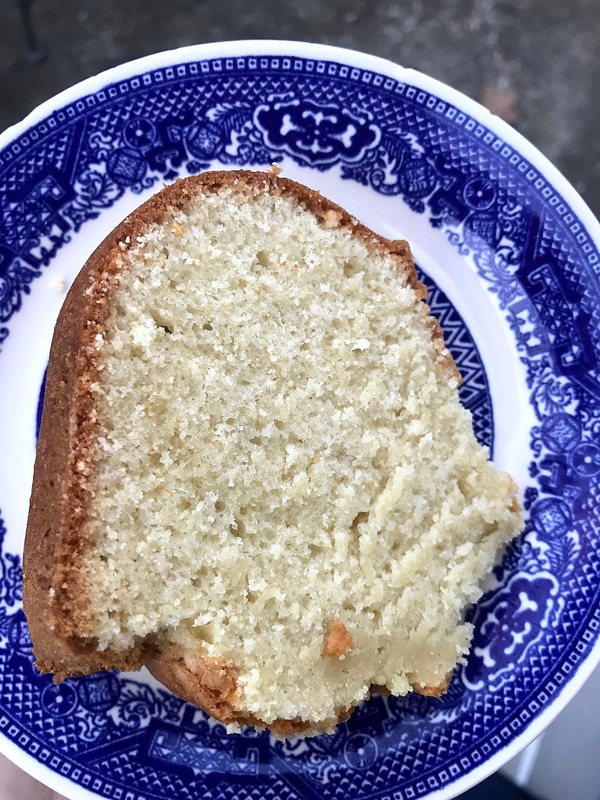 I love a great pound cake and this recipe looks delicious. Hope you are having a great day and thanks so much for sharing your awesome post with us at Full Plate Thursday. This looks delicious! Thank you for linking up with our Friday Friends Parade! I love a good pound cake recipe. Thank you for sharing at Create, Bake, Grow & Gather this week.